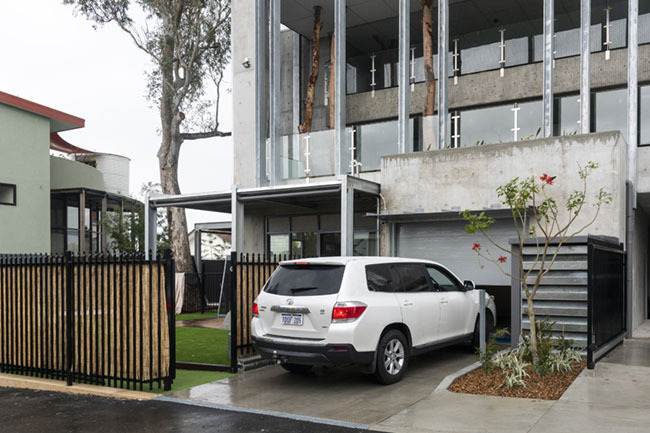 Need a car parking lift that can also transport people on board? Total Rex FP offers you an extremely secure and reliable vehicle parking solution. With control panels placed on top of the platform, absolute safety and reliability – both for people and the car on board – are guaranteed. Total Rex can be safely operated by a person seated in the vehicle. NB. for the sake of clarity, this photo has been taken with Total Rex inside a warehouse, since the mechanism would be obscured once Total Rex is installed in its usual pit. Wheel stops help prevent the vehicle from oscillating back and forth once on the platform, ensuring complete vehicle safety. 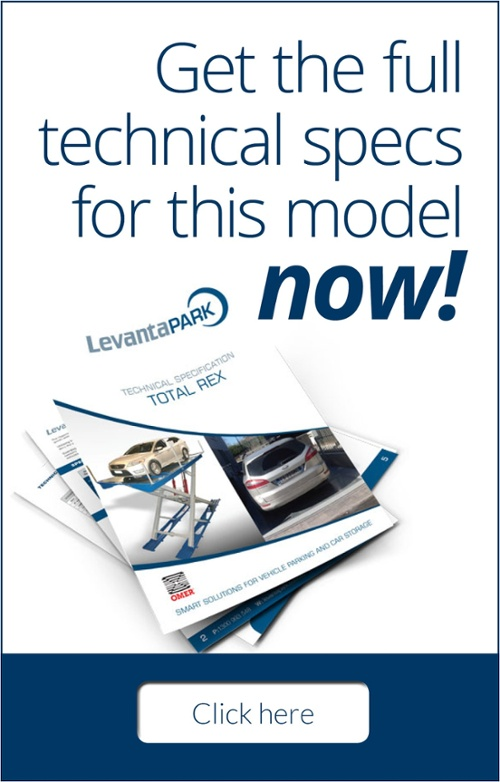 As with all LevantaPark lifts, weight is perfectly balanced on the Total Rex platform, no matter where it is positioned. This means the platform is always perfectly parallel to the ground while lifting, without any torsion or bending at all. On the platform’s short sides, two photoelectric barriers automatically block the vehicle if it moves, protecting the vehicle from damage against the surrounding wall. Total Rex's photocells fit inside a galvanised iron structure that protects the transmission system, the receiver, and the electrical connections. Not just one of the most reliable car lifts on the market, Total Rex is also one of the few vehicle elevators that allows a person to remain on-board during operation. The pushbutton control panel’s electrical connections run to the electrical panel through special aluminium ducts that prevent deterioration and tampering. The control panel’s position has been carefully designed to ensure that, when the vehicle stops, the driver can easily operate the lift while comfortably seated in the vehicle. The pushbutton panel also has normal controls to reach the desired floor as well as emergency buttons and an interphone to communicate with the outside world using a telephone dialler. Detail of the electrical connection to the control panel. Note the aluminium duct the connections pass through. The maintenance panel allows the operator to move the unit from various positions, providing access under special circumstances and in full safety. 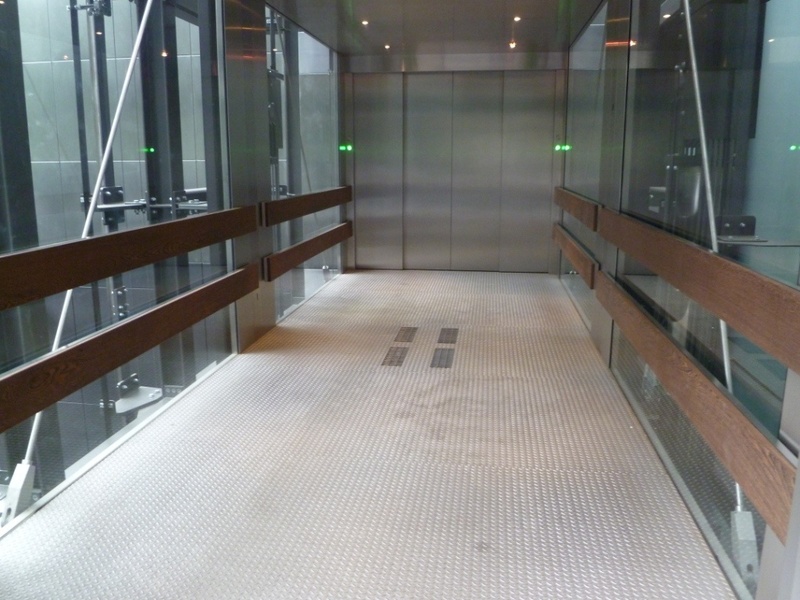 The pushbutton control panels on the various floors are used to call the lift. Safety keys keep out unauthorised users. Total Rex's electro-hydraulic unit is extremely compact, and the entire control unit requires minimal space for installation. The Total Rex electrical control panel is normally installed on the wall above the hydraulic unit. Its telephone receiver is connected to the intercom on the platform. Detail of the optional lock for manual control of the doors. A telephone dialler on the electrical panel can repeat dial seven numbers continuously, until the first available number answers. 22 included country codes make the Total Rex unit easy to adapt to national telephone networks. Magnetic sensors control the opening of the Total Rex's motorised doors. Connection to the control unit enables or disables automatic opening of the doors.